Tensions are growing at Yilport’s port development project at Puerto Bolivar, Ecuador. 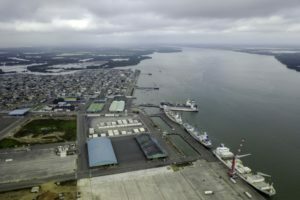 Patricia Henríquez, the deputy of the El Oro province, where the port is located, has sent an official request last week to the Ministry of Transport and Public Works, the Internal Revenue Service, the Port Authority and Yilport Ecuador asking to report on the revenue earned since the start of the Turkish terminal operator’s concession, informs the provincial daily El Orito. The deputy requested the investigation of the revenues of Yilport Ecuador, how much the company pays to the government through taxation and how much to the Port Authority or the Ministry through the concession contract. Besides, the investigation will look into the regional revenues – the Machala municipality and the El Oro province – which should be no less than when the port was managed by the Port Authority. The Minister of Transport and Public Works, Paul Granda, is already reported to have said the government would set up a commission to review the concession. “Now we see that the port’s export volumes have declined and they [Yilport] have not done anything what they offered. They promised to bring clients that export from the northern Peru, from Loja, Azuay and we can see none at the moment, nor there have been any negotiations so far. Puerto Bolivar is being prejudiced, this concession has no beneficial effect,” claims Patricia Henríquez. The deputy highlights that she fully supports the local workers who mentioned at a recent meeting that 300 jobs have been lost: “The port has always been a source of work for the people. We shall continue fighting so that the concession would not affect, as it already starts to affect, the development and productivity of Puerto Bolivar”. Apart from the job losses, there are other disturbing questions that pertain to Yilport project. One of them is the dredging works Yilport is doing now to deepen the draft of Puerto Bolivar from 10m to 17m. The Environment Ministry requires the Turkish company to make changes in their Environmental Impact study, where the Ministry identified a number of shortcomings and irregularities. According to the Ministry, the dredging may negatively affect the shrimp production area of 39,000 hectares. Another public concern is that the growth of port tariffs damages the nation’s agricultural sector. In mid-November, banana producers, exporters and stevedores marched in the El Oro province’s capital Machala in protest against Yilport’s increase in the port fees. According to the local media, the charges will go from USD 0.17 – 0.15 paid by the exporter and USD 0.02 by the Government – to USD 0.24 in 2018 and USD 0.28 in 2019. In total, the protesters oppose 27 fees, some of them will grow 100%, whereas others were newly imposed by Yilport. The president of the Association of Banana Exporters of Ecuador (AEBE), Eduardo Ledesma, said that with these charges, the El Oro banana farmers have to either disappear or ship their products from Guayaquil, Ecuador’s major port, where they would be charged USD 0.13 for the same work. In either case Puerto Bolivar would suffer, as the sector is one of the main cargo generators. El Oro is the southernmost of Ecuador’s coastal provinces and one of the world’s major exporters of bananas. About 50% of the country’s banana producers are concentrated here. The Puerto Bolivar port currently exports 30% of the country’s bananas. Yilport Holding, a YILDIRIM Group company, obtained the 50-year concession to develop Puerto Bolivar in August 2016, marking the largest ever Turkish investment in Ecuador. The company intends to invest USD 750 mln in the expansion and modernization of the port. Upon completion of 5 investment phases, the port’s annual capacity will reach 2.5 mln TEU, making Puerto Bolivar the largest and the most advanced state-of-the-art container terminal on the Pacific coast of Latin America.